But I don't wanna! I cleared the table last night! It's my room – I don't care if it's dirty! Getting our children to help around the house can sometimes seem to be more work than it is worth. But it's important to have our children help for many reasons. 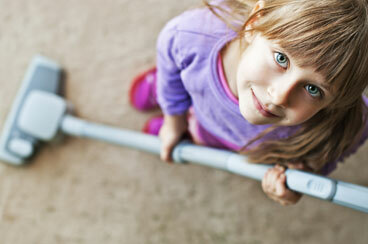 Picking age-appropriate chores and letting our children learn how to clean is half the battle. Early years children can clean their own rooms, dust shelves with a rag, clear and set the table, empty the dishwasher, and more. Sometimes we have a hard time letting them do these things because they don't do it as well as we do. But we have to let it go! If there is still a bit of dust on the bookshelf or if her toys aren't all in the right bin, that's alright. You are teaching your child to be responsible and showing him the importance of working together as a family. If you are a parent, you are likely very busy. You might have to learn to change your standards, at least at first, so that your children can share some of the work around the house. Delegating a chore to your child means that she is responsible for getting any required materials and completing the chore on her own. It won't help to have you hovering over her telling her she missed a spot while dusting. (Imagine if your child did this to you!) After she has finished, praise her for doing a good job and mention that next time she should ring out the rag before dusting. If you are negative or nagging, she won't want to do the dusting next Saturday. Think about having a regular schedule for your child. This doesn't have to be written down, though it could be. Let your child know that he will be responsible for cleaning his room on Saturday and that every night after supper he can clear the table. Other chores such as carrying groceries into the house, shoveling snow or weeding the flower beds are chores that the whole family can get involved in – these also get us outside and exercising! Some parents may choose to give their children opportunities to earn trust, learn responsibility and teach independence to prepare them for when they are 12 and will be able to be on their own for short periods of time. It's a great idea to enrol your child in a babysitting course or similar course to prepare them for when they are 12. You should also take into consideration your child's maturity level, personality and other characteristics when deciding if she is ready for more responsibility. Gradual ways that your child can build trust and prepare for being on her own will be up to you. One way you can safely encourage independence is by dropping your older early years child off in front of her school (do not allow her to cross the street unassisted) and allowing her to get to her classroom on her own. Speak to your child and her school before trying this as you'll want to make sure that you are following the school policies and that you can check to ensure she made it to her classroom.